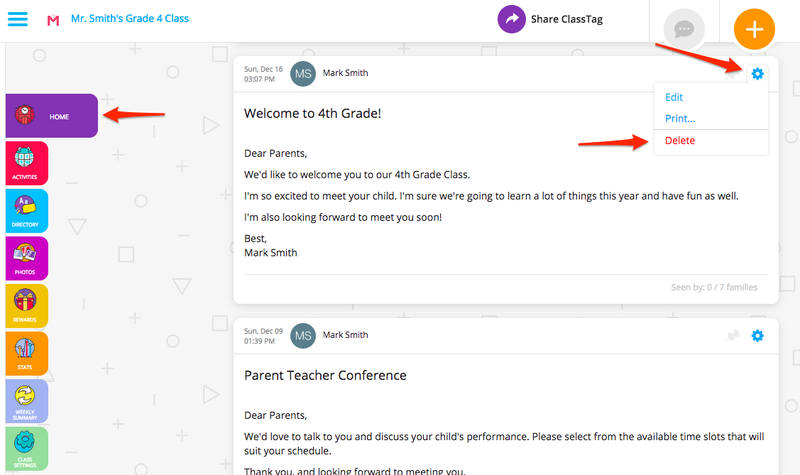 How do I retract or recall a message or announcement that I’ve sent on ClassTag? Quick step on how to retract or remove an announcement on ClassTag. If there’s a need to recall or retract or delete the announcement that was created, you can easily do this by going to the Home page, clicking on the gear icon and clicking “Delete”. Deleting an Announcement is irreversible, so please be careful on doing this. If the Announcement is related to an Activity, only the Announcement will be deleted and not the Activity itself. If you also need to delete the Activity, please refer to this article for the instructions on how to do it. How do I delete/remove activities from ClassTag?